The Paradise Cove luau makes the most of its Oahu beach-side location to provide a unique experience and the scenic sunset becomes part of the show. Before the evening’s meal and music, there are traditional Hawaiian games, such as spear throwing, rolling stone disks and dart sliding. The activities are fun for children, especially after the long bus ride from Waikiki hotels to the Ko Olina Resort where the Hawaiian luau is located. It gives everyone a chance to move around before sitting again to eat and watch the singers and dancers. Demonstrations, such as how to tie a sarong or climbing a coconut tree, are also held at several stages in a marketplace area adjacent to the dinner seating. The ocean proximity makes possible canoe rides and a re-creation of a a traditional hukilau — pulling giant fishing nets from the sea. The constant activity allows you to choose which event to participate in, and you’ll need to choose because there isn’t time to do all of them before the imu ceremony that signals dinner is ready. Last night was my first trip to the Paradise Cove Luau. They managed the crowd well, moving the six bus loads of people quickly into the luau area, through the activities and meal service. When I attended a nearby luau last August, there were 14 buses, and the tables last night also indicated many more people could be seated. However, just with the crowd last evening, there were lines at popular activities, such as the temporary Polynesian tattoo. The lines at the bar also made it difficult to use the three drink tickets that come with admission without some focused effort. While the movement from one stage to another was good for younger folks, anyone who is mobility-challenged will find it difficult. In that case, the best bet is to just go to the amphitheater surrounding the imu (underground pit) where the hog for the evening meal is roasting. 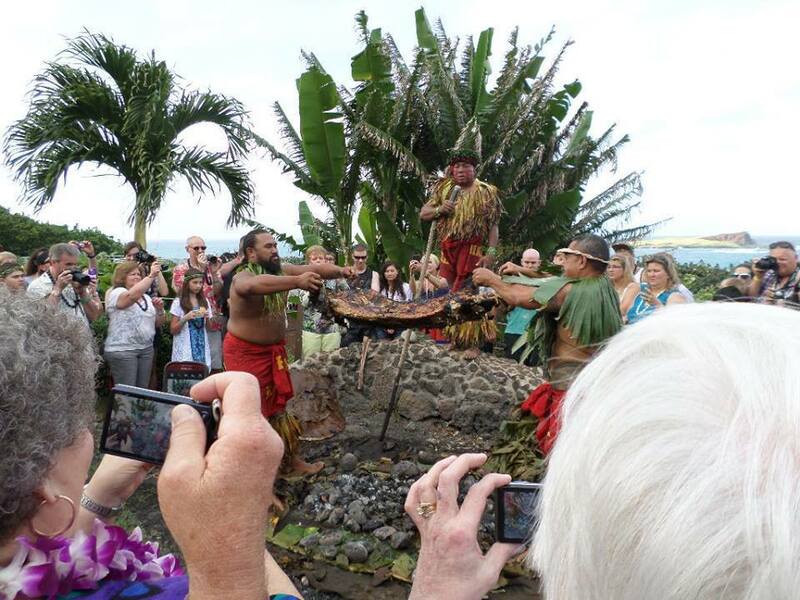 The ceremony at the imu took place at sunset, providing a dramatic backdrop for the dancers portraying the Hawaiian royal court and for the lifting of the hog. This was the highlight of the evening for the locals in our group, although visitors were entertained by the songs and dancing that followed the meal. The food is ample and tasty, including kalua pork, lomi lomi salmon and poi for a taste of traditional Hawaii, fish and rice; mac, tossed and pasta salads are standard local fare, and fried chicken offers a safe alternative for conservative eaters. The show is polished and full of shimmy but the songs and hula are more dinner-show than traditional.